The Rampart Duo™ Clinical (RaDical) Post-Market Registry Study is being conducted at multiple sites across the U.S. 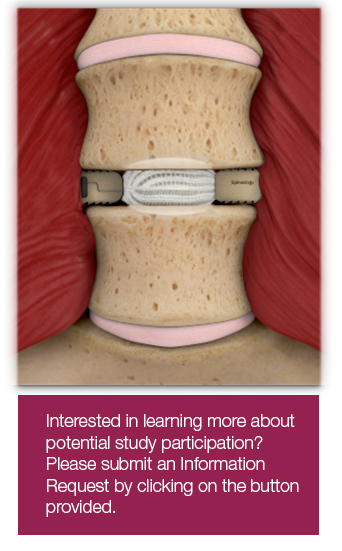 This study collects data that reports on the clinical outcomes of patients treated with the Spineology Duo™ device in a standard of care instrumented lateral lumbar interbody fusion procedure at one or two contiguous (adjacent) levels. The target study population is skeletally mature individuals between age 21 and age 80 that have symptomatic lumbar degenerative disc disease (DDD) at one or two levels for which they are undergoing a lateral lumbar fusion. Study participants are followed to a maximum of 24-months. Serial study evaluations include physical examinations, physical therapy surveys, radiographic imaging, and CT scans for fusion assessment. If you and your care provider have jointly made the determination to treat your DDD condition with the Duo device, you may qualify for study participation. A complete list of the study entrance criteria, site locations and study parameters, is available at www.clinicaltrials.gov. The Duo System offers a unique implant design that is the first to combine PEEK, titanium, and a graft containment mesh. The design dramatically reduces the surgical access required to implant a device compared to traditional lateral systems, to minimize the nerve and soft tissue retraction required for the lateral approach. The Duo implant, filled with bone graft, creates a large, load-sharing, endplate-conforming graft to help maintain spinal correction and support fusion.